Almost all spreadsheet and accounting packages will import data from CSV (comma-separated values) file or from Excel (with the file extension xlsx). You can instantly export any report in Noko as CSV or Excel with one click, as well as download CSV files of your team members, tags, projects and invoices. Just look out for the Excel and CSV download buttons. Clicking these buttons will, after a few seconds, make your browser download a Excel or CSV file. It's literally just one click to spreadsheet goodness! Most browsers either show you where they downloaded your file, or they put downloads in your Downloads folder. Our Excel export supports Microsoft Office 2007 or later. Our CSV export uses Unicode formatting (UTF-8) and commas as separators and quoted strings when necessary. You can later import the CSV files you export with Noko (for reports without aggregation options). This is a great way to keep private backups of your time tracking data. Note that there's some size restrictions in place to prevent exported files from getting too large. If you have to export a lot of data (10,000+ entries), consider exporting by calendar month or by project. 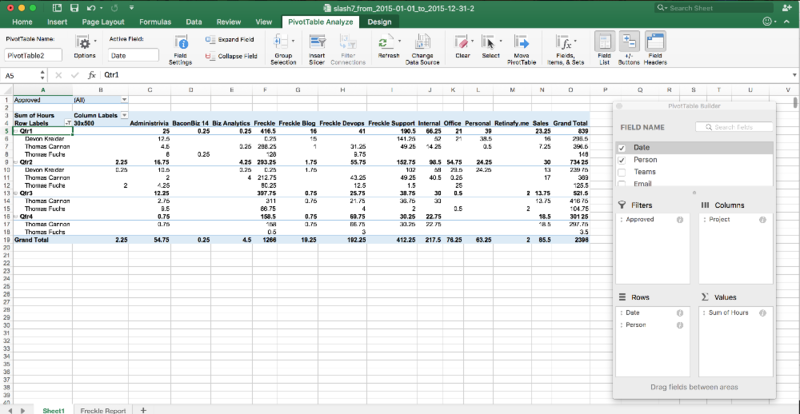 Exporting as CSV and Excel is also available to clients that you share reports with. Note that Noko does not create QuickBooks files directly, however we integrate with QuickBooks Online to directly export time tracking data to QuickBooks.